IF YOU ARE CONTACTING US ABOUT AN URGENT ISSUE, PLEASE CALL AT THE NUMBERS LISTED ON OUR EMERGENCY PROCEDURES PAGE. STUDENTS IN-COUNTRY SHOULD CALL THE ON-SITE STAFF ON THE ARCADIA 24/7 PHONE NUMBER PROVIDED TO THEM. EMAIL ACCOUNTS ARE NOT MONITORED 24/7. Maureen is the Director of Health, Safety, and Security for the College of Global Studies. She is responsible for developing and maintaining The College’s emergency protocols and policies, collaborating with overseas staff on risk assessment, program safety and security, and training staff on health and safety issues. Maureen is a Philadelphia native and a graduate of Temple University, where she earned a B.A. in Studio Art. As an undergraduate, Maureen studied photography and fine arts; she discovered her passion for international education when she participated in an intensive art workshop in Tokyo, Japan. Following her undergraduate degree, Maureen worked as a photographer and artist for several years before returning to Temple, where she ultimately found her career in Education Abroad. At Temple, Maureen was responsible for administration of the university’s programs in Italy, Japan, and Spain, with a particular focus on health and safety matters. Maureen has presented widely at NAFSA both regionally and nationally, has served as Chair of the Local Arrangements Committee and as a Membership and Networking Coordinator for NAFSA Region VIII, and has been a member of the National Gilman Scholarship Selection Committee. 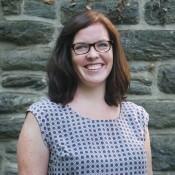 She also holds a Master’s degree in Educational Leadership and Policy Studies from Temple University.